View More In Book Making & Binding. 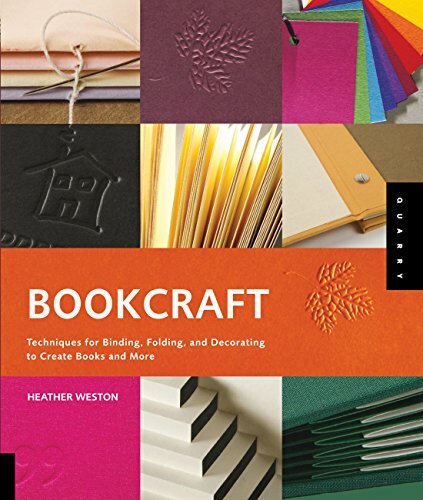 From heirloom memories to unique journals, albums, and altered books—or simple tag books for your kids—Bookcraft contains all the skills you will ever need. Books are a central part of life, and have been with us for around 2,000 years. Although most books we use are produced commercially, many of us are drawn to the book form in its various guises, and are interested in exploring how to make books of our own, whether as a vehicle for telling stories, as scrapbooks, or as notebooks and journals. This guide provides the essential ingredients for designing and making your own books, from simple binding and finishing techniques to complex complete products. Projects are designed to suit a variety of skill levels from beginner to advanced, and use a step-by-step approach to learning the necessary skills. Each project begins with basic techniques and progresses through to thought-provoking applications of those techniques. Each technique includes an example of a finished book that fully and beautifully utilizes the methods described by the techniques. This book explores more experimental binding and page treatment techniques, and has a comprehensive gallery of ideas outlining the skills and materials needed to apply techniques often reserved for professionals. If you have any questions about this product by Brand: Quarry Books, contact us by completing and submitting the form below. If you are looking for a specif part number, please include it with your message.